According to industry data, truck driver retention is the most pivotal key to logistic company success in 2018. While technology focused on collecting data on truck drivers has been all the rage, drivers themselves are revolting against Big Brother-esque technology (think dash cams and ELDs) that provide scarce – if any – value to the drivers themselves. In 2018, logistics companies looking to gain an edge must zig where everyone else is zagging by placing a profound emphasis on truck driver retention. The best way to do so? We are about to show you. 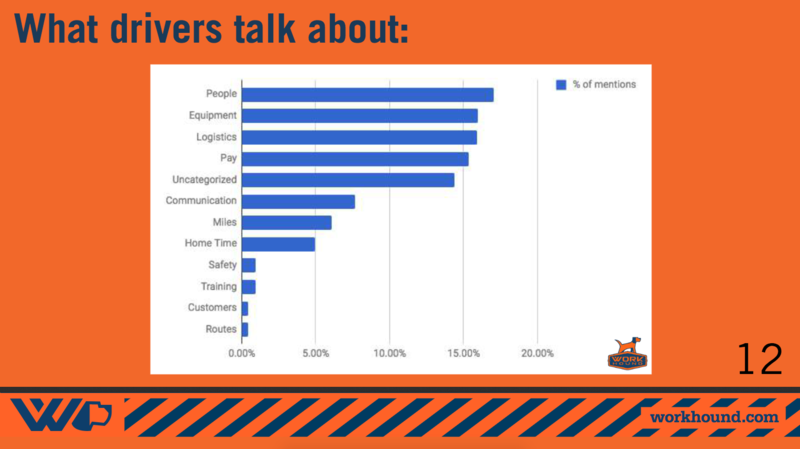 The following is a list of truck driver retention best practices curated from years of research by the Workhound team and our established partners like HireRight. You can access deep dives on each of these subjects via our Resources page. But at a high-level, the main driver retention best practices you need for 2018 are below. Asking for truck driver feedback may not seem like a radical advance forward for truck driver retention, but in fact, it’s the critical first step. Truck drivers may or may not be full-time traditional employees for your business, but they must be treated as such. Where most transportation companies fail is in taking for granted the need for their drivers to be heard – just like any other employee. Your truck drivers are no different from your sales reps, your management team, your accounting team, and so forth. They make your business go. Give them a forum to submit their thoughts and insights on how the business and running, and you’ll be shocked at how quickly the feedback will impact driver retention. Once you’ve solicited driver feedback, the next step is to act on it. Don’t let driver requests, complaints, concerns, or suggestions sit idle in the truck bay. If their feedback is actionable and valid, act upon it. If it is lacking understanding, let them know why. Enlist the help of your operations, recruiting, and human resources talent to formulate a strategy for responding to driver feedback. This is where Workhound comes in. The goal with all driver feedback-based communication should be to create a dialogue and rapport with your drivers. Dialogue and rapport is a means to an end – the ultimate goal is to build trust with your drivers. Honest, open, and authentic communication is key here, so is consistency and forum. Give your drivers a vehicle for clearing the air and expressing themselves to your management team. Collect insights from these conversations, so they can be used to influence future company practices and strategies. Where possible, give drivers better routes that let them stay home more and avoid putting them on cross-country routes that lack consistency and proximity to their family. Drivers have families, hobbies, holidays, birthdays, graduations, anniversaries, and the like to attend, too. Give them more opportunities to be present for those special events. Give them more opportunities to keep semi-regular hours and spend time with their loved ones. This move will engender loyalty for all kinds of obvious reasons. Reinvesting that money into truck driver compensation is going to generate major returns for your business in the form of happier, better incentivized drivers who are more likely to stay loyal to your company. It’s the best place you can invest your money in 2018. An important final point on pay: make sure your compensation plan is clear. Truck drivers value that as much as anything, according to our 2017 survey. Looking for more insights? Check out the following resources on the Workhound Resources page.